Increased consumption of sugar is linked to higher diabetes rates independent of rates of obesity. In other words, regardless of weight, sugar causes diabetes. In fact, the research controls for everything and meets longstanding criteria for causation. Given these findings, it is proof enough that sugar is poisonous and it is time to regulate by removing fructose from the safe list and setting limits on how much sugar can be added to a food. It is clear that obesity is not the cause of our dramatic increase of chronic disease but instead metabolic syndrome, which is a problem for normal weight people as well. 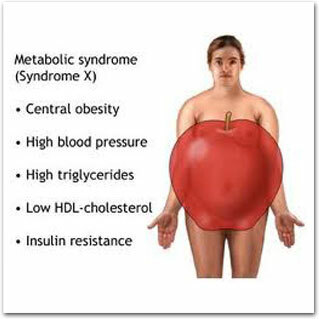 Metabolic syndrome is a result of insulin resistance, which is caused by consumption of added sugar. If you want to live longer, be healthy, lose weight – get rid of the sugar. The Skinny Coach diet is a sugar abstinent diet and will make you healthier than you have ever been. Take the quiz and find out if you have metabolic syndrome. Posted in Illness, Sugar and tagged diabetes, disease, metabolic syndrome on January 2, 2014 by tiffany.